NEW YORK, NY – (ACN Newswire) – via NEWMEDIAWIRE — Tauriga Sciences, Inc. (OTCQB: TAUG) (“Tauriga” or the “Company”), a revenue generating Company that operates through the development, distribution, and licensing of proprietary products as well as the evaluation of potential acquisition opportunities and equity investments, today announced that it is developing a special miniaturized Airport version of its CBD Infused chewing gum (branded as: Tauri-Gum(TM)). The Company recently announced an increase in its Research & Development (“R & D”) budget, aimed at continually enhancing its Tauri-Gum(TM) product line. Tauriga envisions this Airport version consisting of a miniaturized blister pack, containing three pieces of its CBD Infused gum (anticipated retail price of $6.99 per unit). The Company is in the process of miniaturizing the graphic design and label wording, to correlate with this newest proposed product version. Tauriga Sciences, Inc. (TAUG) is a revenue generating Company that operates through the development, distribution, and licensing of proprietary products as well as the evaluation of potential acquisition opportunities. One such opportunity on which the Company has acted, involves the Company having entered into the cannabidiol (or “CBD”) infused chewing gum product business, as more fully described above and in prior press releases. 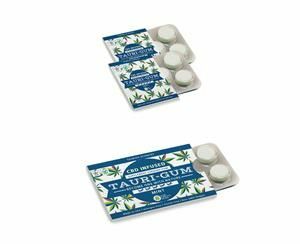 This CBD infused chewing gum product has been branded under the following name: Tauri-Gum(TM). See also our periodic reports filed by us with the SEC for a more complete description of our business and material agreements that we have entered into. Further, the Company continues to identify and evaluate additional potential opportunities to generate revenue, as well as shareholder value, and leverage its resources and expertise to build a diversified and sustainable business model. Please visit our corporate website at www.tauriga.com. There can be no guaranty that the Company will ultimately be successful in developing this Tauri-Gum(TM) Airport version or bringing it to market.